Israeli soldiers abducted, on Tuesday at dawn, six young Palestinian men from their homes, in Jenin governorate, in the northern part of the occupied West Bank. Media sources said dozens of soldiers invaded Jenin refugee camp, before the soldiers stormed and ransacked several homes and abducted Mohammad Samir ar-Rokh, Jihad al-Fahed, Yazan Salit and Mohammad Yousef al-Ghoul. They added that the soldiers also invaded homes in the al-Hashimiyya town, west of Jenin, and abducted Ahmad Jawdat Jaradat. 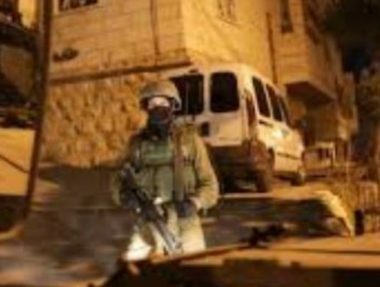 The soldiers also abducted Aqabat Nafe’ Yahia, 28, from the al-Hashimiyya town, after storming a store in Barta’a town, southwest of Jenin, which is isolated and surrounded by the Annexation Wall.